Ten years ago, I was in grad school studying the way people interact with technology. At the time, smart phones were just starting to become popular here in the US. The idea of a camera/phone hybrid was still new and people were figuring out how they might be useful. I remember the first time I thought to take a picture of my box of almond milk, so I could remember what style to pick up at Trader Joe’s. Weird to think that was a novel idea at one time. Today, I use my phone for everything. Like many of us, I make lists, I capture ideas, I explore photos. I’ve found it particularly helpful for organizing and planning my sewing ideas. I thought I’d share some of the apps I’ve found most helpful. I’ve used Evernote for years to organize my notes, but in the last year I’ve become a diehard fanatic. Why? Evernote is super simple and flexible. I can use it to make to-do lists, organize notes into groups (called “notebooks”), tag individual notes, and share notebooks with other people. Best of all when it comes to sewing, I can take a photo with my phone and upload it right then and there. It’s great for capturing ideas on your phone, tablet, or computer. This is a newer one for me, but I’ve found it a pretty neat tool, especially in conjuction with a note-taking tool like Evernote. Skitch lets you take a photo with your phone, then easily annotate it with text, arrows, and more. 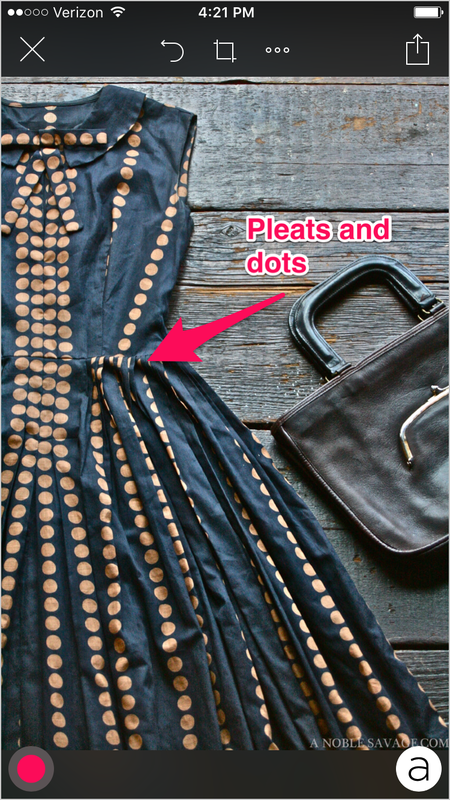 You can use Skitch to take a photo of a garment you like, and mark the elements that inspire your own sewing project. You could also use it to take notes when you’re fitting a muslin. Often, problems are more apparent in photos and easier to analyze than in a mirror. You probably already use Pinterest, so this might not be news to you. 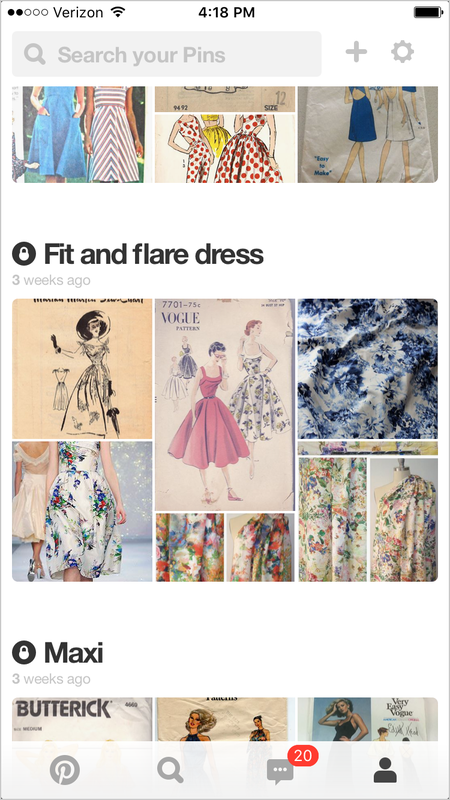 But lately, I’ve been using Pinterest to plan individual sewing projects and create a queue of sorts. I create a board for each individual project I want to make, then pin patterns, fabric, and inspiration. When I’m done with the project, I just delete the board. 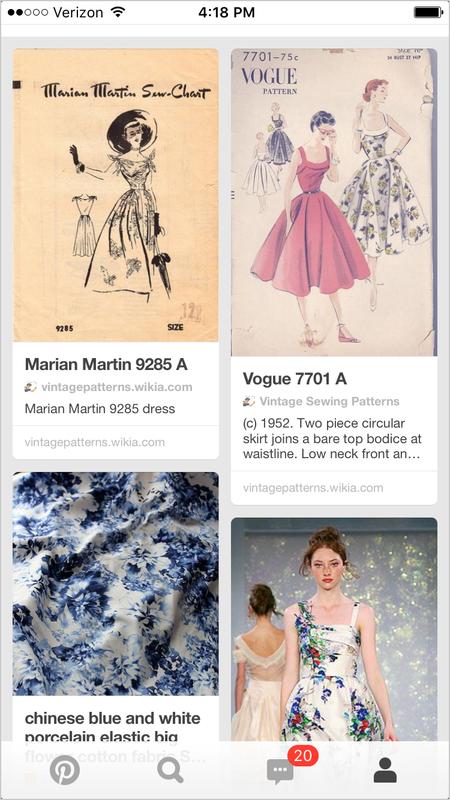 You can use Pinterest on your phone and upload photos of fabric you see when you’re at the store, too. It’s handy. Another one that’s been around for a while. 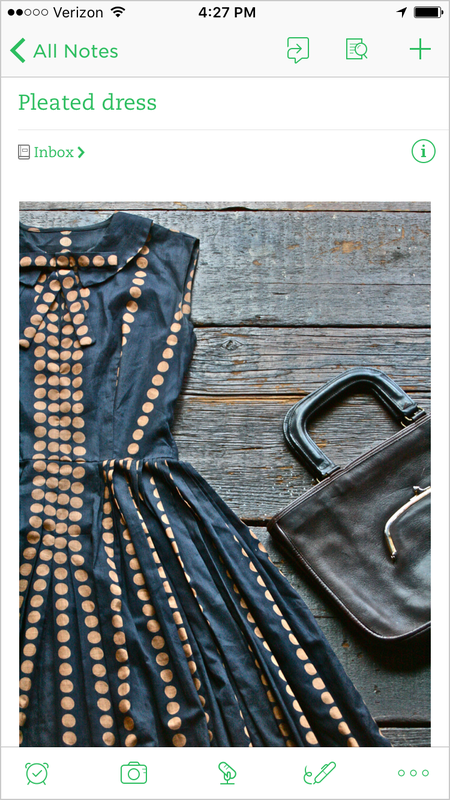 I kind of feel like I’m in the 1% minority of people over 30 who use Polyvore, but whatever. 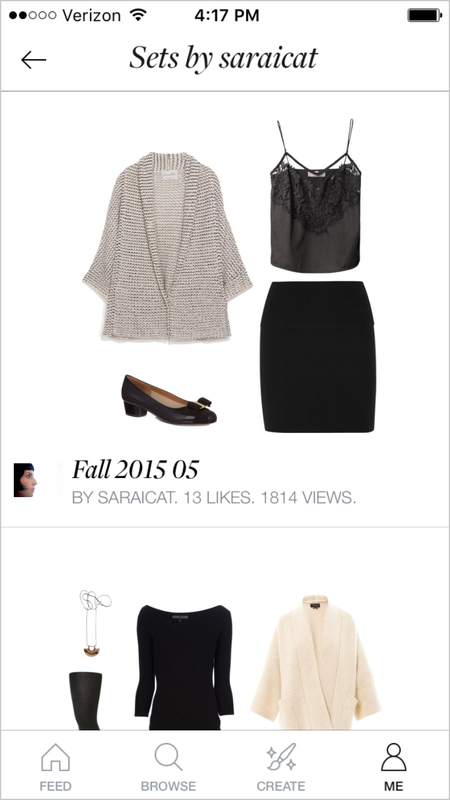 What I like about polyvore is that you can create outfit ideas and capsule wardrobe ideas pretty easily. I find this useful before I actually start a new project, because it gives me a better idea of how I’ll actually wear it. 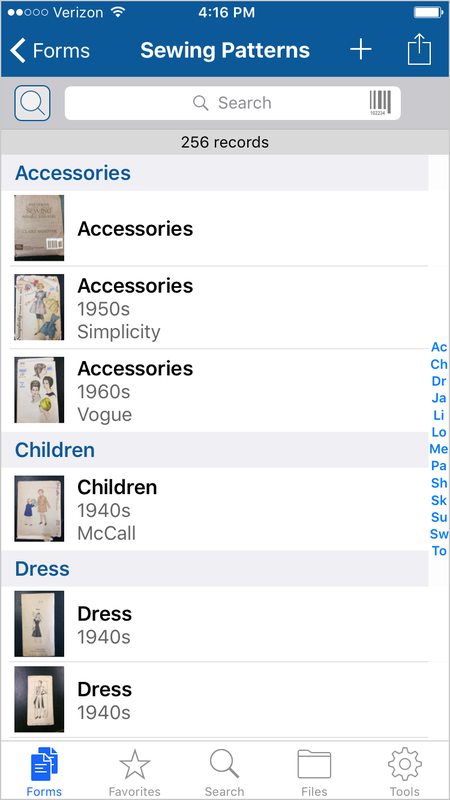 I wrote extensively in a prior blog post about how I use Tap Forms to organize and catalog all of my sewing patterns. I still use Tap Forms all the time! You could also use it to organize your fabric stash, though keeping it up to date is always the tricky part where fabric is concerned. The Strides app is a little different. 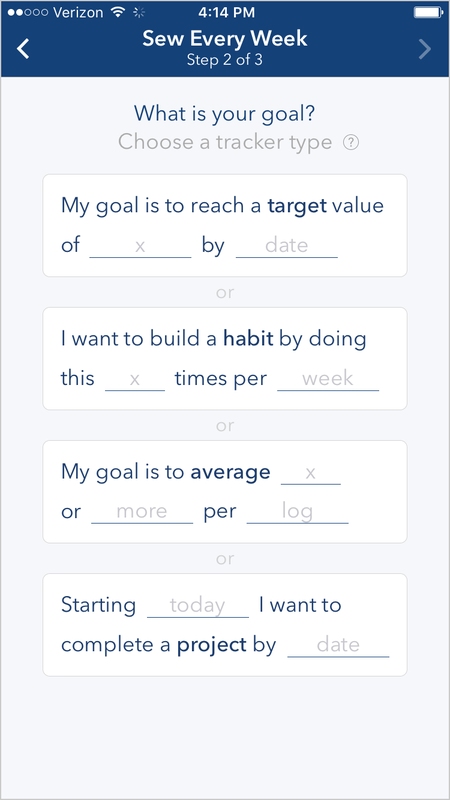 It’s designed to help you set and track your goals. You add a goal to the app, and set how often you’d like it to remind you. You can set all kinds of goals. For example, you can set a goal to sew twice a week and track that. Or, you could set a goal to finish 10 garments by a certain date. You can even set a goal of completing an average number of projects a month. 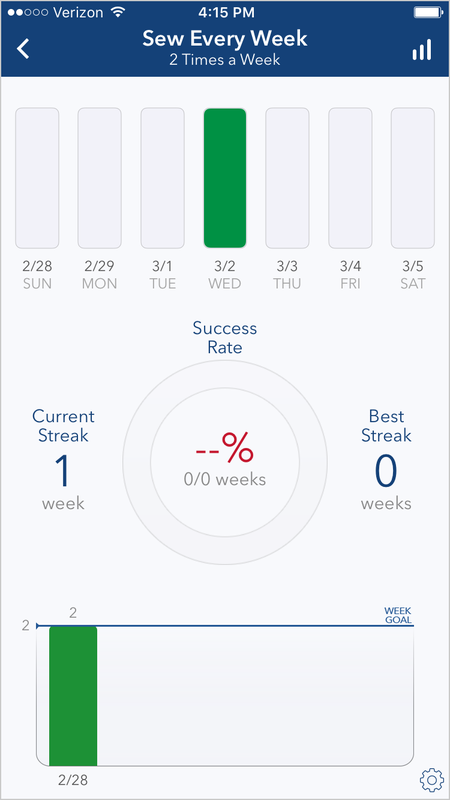 The app lets you track your progress over time, and reminds you to update your goal. It’s pretty cool. 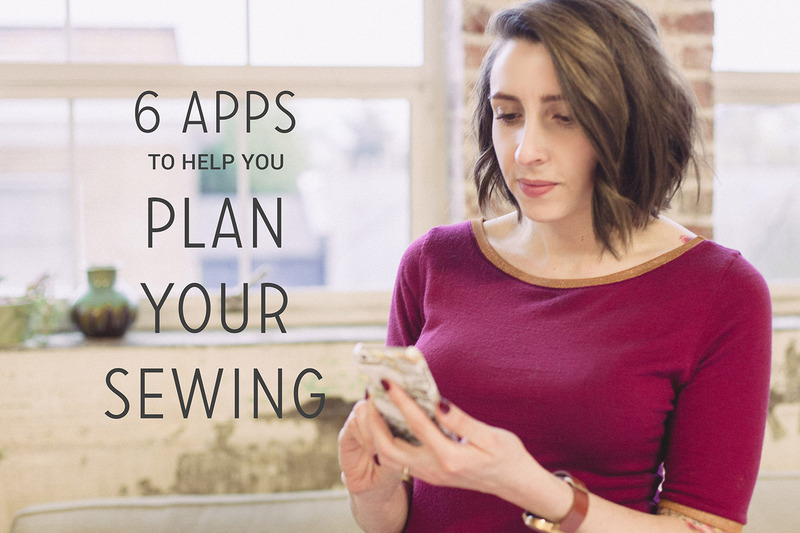 What are your favorite apps for organizing and planning your sewing? Share yours in the comments! How do you plan your sewing? I just downloaded Pic Stitch yesterday to make photo collages. It is free. I am still getting to k now the app, however I think I will like it. Trello. Camille at Attack of the Seam Ripper did a great three-part series on how to use it to organize patterns, stash, and projects. It’s also great for organizing blog post ideas. I plan to use to to organize home improvement projects. Oh, and Memento Database. I use that for patterns because it’s supported by Android, whereas Tap Forms is Apple-only. I keep my patterns in a pattern filing cabinet that had been retired from a fabric store. My patterns include vintage as well as new Big-4 and indie and they are various sizes. The pattern cabinet was made for one brand of pattern and I need to do some adjusting so it better fits my patterns (for example, new Vogue and Decades of Style patterns are in large envelopes. I just tried out Trello as a digital fabric stash organizer. Has anyone else used this? I haven’t committed yet. 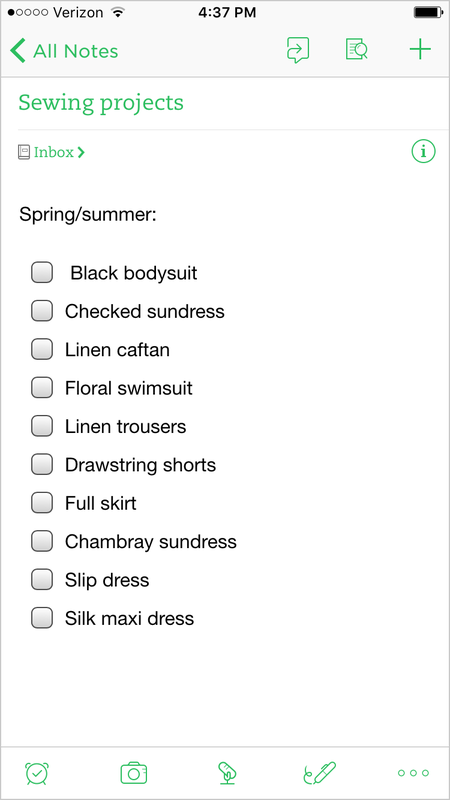 I use Evernote to catalog my patterns — but don’t see why I couldn’t use it to catalog fabric, too. Wow, thanks for the summary of apps. Very helpful. I currently don’t use any (I save my free time for blog reading) but I think my stash is at the point where Tap Forms could probably be quite useful. I actually started to do a swatch journal by hand, and found it to be useful, so I guess I have proven to myself it might not be a waste of time. Otherwise, I just enjoy pulling out the stash and playing in it for inspiration on where to go next. Trello! I use trello for everything. I’ve got a fabric stash board, patterns, kids patterns, and projects. My favorite part is that I can make a template card and then copy it wherever I need one. Works really well for project notes formatting! It’s also collaborative. I’ve got boards for book clubs, house hunting, backpacking trips, everything! Otherwise, I’m pretty old-school. I work with computers and smartphones all day so I prefer to do my hobby without one where I can. I just have a to-sew list on my iPhone’s reminders app and I use the notes field to write down what pattern or fabric I’ve decided to use and what notions I need to buy. What I’d most love to find is a tool that would make online fabric shopping simpler. It’s so hard to find exactly what I’m looking for through a Google search and trawling through lots of online stores takes forever. Pinterest was a go-to spot for me until just recently when it seems to have been overtaken by sites seeking to sell things. Links on Pinterest are no longer as reliable as they once were. Now, I check the viability of every site prior to saving it, and that’s time-consuming. Used to be that I could pin with confidence, knowing pins were reliable, but then it seemed like each pin directed me to one site then another, and I was chasing around to find the original resource.. While I still subscribe to follow sites, like Colette, that I love on Pinterest, I do not view that resource as reliable as I once did. I use Evernote to keep a track of my patterns, Pinterest to plan what I’m going to do and Polyvore to work out my wardrobe. I use polyvore a lot to plan what I’m taking on holidays as well. It really helps if you travel light. I like to just take carry on size luggage and if I’m spending 3 or 4 weeks in Europe, planning carefully is essential! Thank you, this is very useful personally and also a topic I am very interested in! I am an amateur sewist and a professional software engineer so I’ve been tossing around the idea of a sewing app that could take advantage of the incredible power of our phones to keep track of stash, patterns & measurements (for those of us who might sew for a few different people) but also help us plan makes using a personalised croquis, and combining that with fabric and pattern. Thanks so much for sharing your working model! This post inspired me to utilize my Day One journal app to create a sewing journal. Pictures can be inserted in the journal. 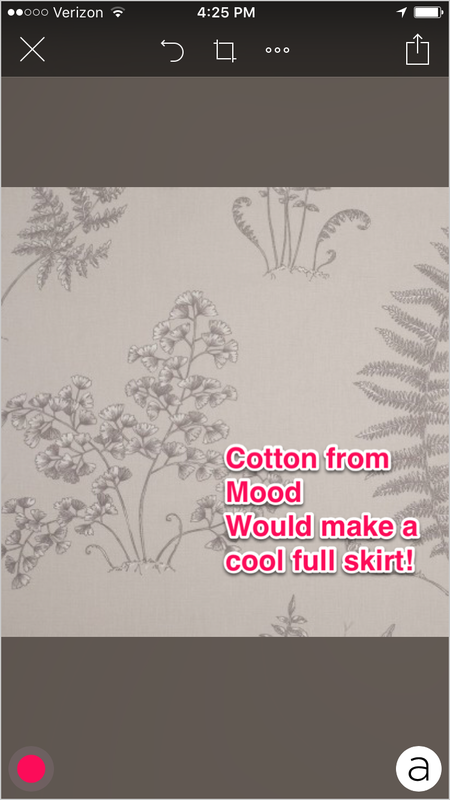 In this instance, I would would add photos of the pattern, my fabric, trims and notions etc. Also, I can describe any details or thoughts about construction. Perhaps I can build in a timeline? Give myself deadlines for a project? Lately, I’ve been working on multiple projects which is very distracting and overwhelming. Thanks again for the timely post Sarai! Trello and Boxes are my go to apps. Trello for planning my projects (either individual projects or seasonal wardrobe goals) and boxes for my patterns and fabric stash. Uploading all of my patterns at first was a pain, but I now try to upload as I collect and it’s worked pretty well. Trello is an app I just recently revisited. I used it briefly for project management for a non-profit that I co-directed with my husband, but stopped when my art director took a new job. Coincidentally, took a second look at Trello last week, and am wondering more about how you use it and set it up for sewing purposes. Hope to hear more. I also have a Google spreadsheet of fabric requirements for patterns in my stash for those impromptu trips to the Garment district! This way I don’t get caught not knowing how much of that perfect fabric to buy for my next project. Your post on tap forms inspired me to try it and I’ve been loving it for keeping my patterns inventoried. It’s perfect as I can keep a picture of the back of the pattern too and effectively have my entire pattern stash with me when I step into the fabric store or shop online. I use Evernote for cataloging both my fabric and my pattern stash but it sounds like I need to check out Trello for my pattern design. I’ve searched for something with templates and a commenter above refers to that in Trello. Yes it’s a little work in the beginning but I cannot imagine leaving the house without my complete stash with me now. Thank you for this. Sometimes an app seems like a really good idea (in premise) but ends up sitting on my home screen. I really appreciate you posting apps you’ve used and feel have value. I love polyvore. I’ve been on it forever too lol. I’m always surprised when people say they haven’t heard of it. I was immediately drawn to Trello and I stuck to iit for the various stages of sewing planning and execution, sewing-related buys etc. I use Pinterest for inspiration boards. I use Evernote because it will sync a file between my pcs, ipad, an phone. So I can add or make a change to a file and have that info available wherever I am. I use it for patterns, my birthday lists, items needed to buy…. The lists just keep going on. Sarai, I feel technically challanged by apps., but you’ve inspired me to check out evernote. By the way, I LOVE THE BLOUSE YOU ARE WEARING! Is it a pattern from Collete or off the rack. Beautiful combinations of the maroon and gold trim. Definitely need more android apps! I sew for my family (7) and my 2 small grandsons. Lots of patterns, measurements and fabric to know eep track of! Like Virginia, I’m down with Excel, but I’m always looking for something that provides a bit of hope and optimism that I really can organize my projects and ideas. As someone who tolerates a fair amount of chaos, I also have that weird super-micro-organizing thing. 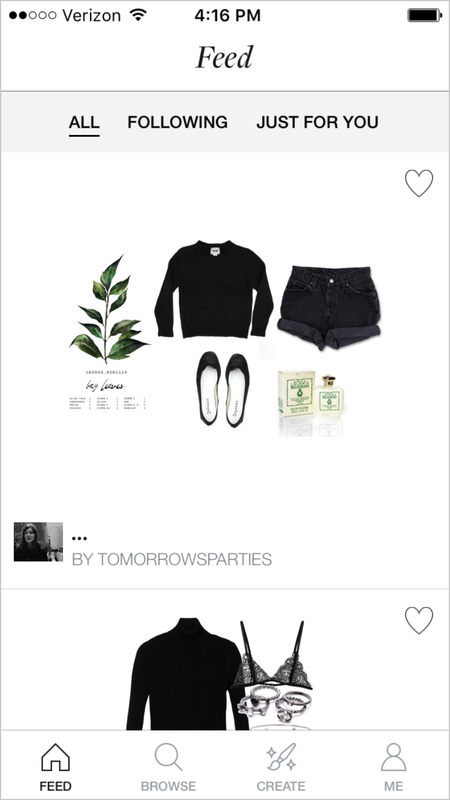 Polyvore can be fun, but I spend too much time looking for the right items. I think I’ll try Evernote and work on reframing the way I use Pinterest. Thanks for the suggestions! Wish, wish, wish that my brain could process how-to with Excel. Odd to think I used to teach it to pre-service teachers around 2002. The program/app now is far more robust and has exceeded my own limited capacities. If anyone can offer suggestions for simple totes or templates for using Excel, I’d value help. When I think of Excel, I think of numbers, and I have dyscalculia, so there’s the mental block! Waaaaay back in the day, there was Excel and there was also a database program. The two were apparently blended into the current Excel. Internet Time is not the same as sewing time in my mind although I’ve adapted happily to indie patterns in PDF format and think nothing of paying for these while I balk at paying full price for a major pattern company pattern unless it’s on sale for something like 5/$5. Time change. We need to stay updated. I’d be happy to get on the Excel learning curve if it would assist in creating a pattern or fabric file that’s searchable and mobile. One GREAT thing about the Microsoft apps, and I am admittedly an Apple aficionado, is a Microsoft 365 subscription that enables one to save like a terabyte of data to the MS cloud and to access all files from anywhere at any time. So, Excel is worth serious consideration even though it still feels formidable to my limited consciousness. OneNote is my go-to for everything I need to track or reference. I love being able to reference it from all my tech devices and I easy know what I have stashed to work with. We also use OneNote for all our party planning and travels. Its easy to keep track for big or small events. I think everyone should use what they are confortable with, and you have provided some great options. I’d second the suggestion to use OneNote. It’s full-functioned and friendly to images as well as annotations and sorting into folders. This app is good on computers and devices (at least OS and iOS and I believe Windows since it’s a Microsoft app). This is free and super valuable once you get the hang of it. Think about studying a subject and taking classes for which you’d keep separate notebooks. So, maybe you’d have a women’s sewing topic (notebook) with a number of sub-heads (folders). Each folder can hold links to tutes, fabric ideas, notes on sewing experience, sizing and outcomes, etc. You can do screenshots of patterns to save ideas, for example, and add them to a folder about that pattern and fabric specs, etc. The GREAT thing about OneNote is that you can access it easily at the website, and there it is! You can also work on OneNote on your computer and upload it to the site online. Took me a bit of tinkering before I figured out how to make everything happy, but the learning curve was not a rough one. Hope this is helpful. I have Evernote and I hardly use it. Honestly I use a task manager called Pocket Informant and I have a template project with subtasks . for each not project, I create one based on the template and it has steps like “wash fabric”, “cut fabric” , “sew lining”, “insert sleeves”, etc. As much as I love organising things, I don’t use evernote as much as I thought I would. I don’t use Day One even though I have it. I’ve found that at the end of the day, I like to write things down manually so I have a pocket sized moleskine that I use in conjunction with my sketchbook. The ideal soluthion for me would involve paper and technology – something mobile and desktop based. I paid for a subscription to Evernote for a couple of years and invested a lot of time and energy into curating a digital archive. (I think I’m not great at such things….) When I discovered the beauty of OneNote, I dropped the paid Evernote subscription. Fortunately, the folks at Evernote are nice, and all my previously saved items are safely stored and honor the subscription I paid for. Meanwhile, I am still ISO a simple way to create digital archives that align with coherent and searchable databases for patterns, fabrics, even notions such as piping and buttons. Open to suggestions and would be delighted to see any examples of templates (please and thank-you!). As for Evernote: Great idea, but some glitches if there’s no over-arching database to unite all the clips and ideas. See my issues? Am I obsessing for the magic bullet too much? Curator is an app that’s iOS-friendly and offers potential, but I’ve mostly aggregated articles based on interest on issues in the news, in history, in literature, etc. I have not used it for sewing, but it is an elegant app with many possibilities, so I suggest it as one to look at and consider. If anyone uses it for sewing, I’d love to know what you think so I can learn from your ideas. Been with Curator since a freebie, and now it’s a paid app, but it keeps improving and updating, so it’s worth the small investment, and it’s versatile. LOVE thinking about digital curation but have a fundamental block (ADD?) from getting things together to create anything that passes as usable to share at this point. Actually meant to start a new thread regarding Curator. Sorry it landed under feedback for Evernote. Possible for site curators to shuffle this? I use the Closet+ app. It’s actually a wardrobe organiser, but I use it to catalogue all of my patterns, patterns I’d like to try and all of my fabric. I can categorise them into clothing type, and create outfits to match up the fabric in my stash to the pattern – a bit like visual to-sew list). I use the notes section to record how much of the fabric I have. That’s too bad. I bet you can find something similar, though! I’ll bet even many photo editing apps have a feature for adding text and shapes to a photo, which you could use in a similar way. I can store anything on it. I set up folders for each the pattern companies, and use a tab in that folder for each pattern. I can write notes directly to the pattern page, to jot down changes, thoughts, etc. for making the attern. This is a big plus when I’m looking back at my patterns. I’ve been using one note now for over 5 years for tracking my patterns and fabric. This year I am really trying to get better at the technology! On my feedly app I click the saved for later button for blog posts I want to go back to for ideas. Evernote for storing knitting and sewing patterns, Pinterest I can’t always find a pin it button, ravelry website for knitting favorites. I can click the heart button on Instagram but that doesn’t seem to save anywhere for me to look back at? The hodgepodge of apps seems very time conuming to me when it should be time saving! One app where I can save all my project ideas and instructions would make me feel more organized. Am downloading one note! Thanks for the post and ideas! I use Airtable to organize my patterns and my fabric stash. It’s free, super visual and easy to learn, you can customize and add as many categories as you want (or don’t) and best of all, you can share your data. I want something I can access from my laptop, and my tablet, and my phone so that my tired old eyes can do the data entry in large screen comfort but I can still check if I already own something in the fabric store. So far, so good! Thank you very much!!!!! Great tips and so very much appreciated! I am going to use all of these apps soon. Except Polyvore….I’m already addicted to that one, lol. 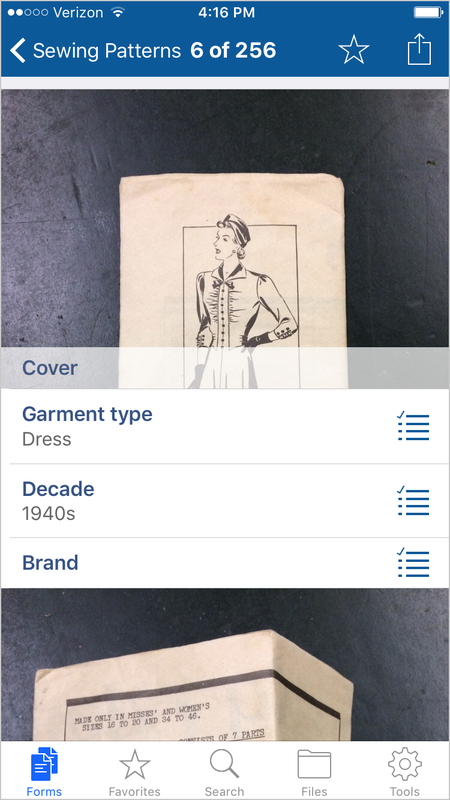 I recently started using the free Snupps app to catalog my many, many sewing patterns. It looks like it works similarly to Tap Forms, but there is also a social media element similar to Pinterest. I recently convinced a few of my sewing friends to join so we can peek through each others’ collections in case we ever want to share or do a sewalong. haha I’ve joined you in the 1% minority of over 30s using polyvore. What a great tool, best window-shopping retail therapy and I might actually get some structure to planning my sewing projects too.